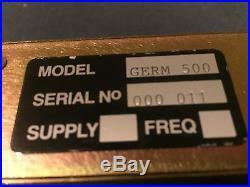 This is a 1st generation Chandler Germ 500 Lunchbox format preamp, serial #11. This is the most burly built 500 unit I've seen. Built like a brick with a classic germanium vibe. Hate to see it go, but downsizing my gear. The original Germ 500 pre had reported issues with compatibility in API lunchboxes with internal power supplies. I myself used this pre in my 6U API Lunchbox, with internal PSU and never had so much as a hiccup, hum or otherwise. From what I understand, if you do experience issues, it can be remedied by locating the unit in a slot away from the PSU. If you're comfortable with this risk, you've got yourself a sweet pre. The item "Chandler Limited Germanium preamp 500 Series Gen 1" is in sale since Saturday, September 17, 2016. This item is in the category "Musical Instruments & Gear\Pro Audio Equipment\Preamps & Channel Strips". The seller is "themasterofscout" and is located in Alameda, California. This item can be shipped to United States.